Jill Corleone is a registered dietitian with more than 20 years of experience. She graduated with honors from New York University and completed her clinical internship at the University of Medicine and Dentistry of New Jersey. Hyperthyroidism causes your thyroid gland to produce excessive amounts of thyroid hormones, which speeds up your metabolism, leading to interference with your heart health, bone health and mood. Symptoms of this condition, such as insomnia, a rapid heartbeat, tremors, anxiety, increased hunger and unintentional weight loss, are often managed with a dose of liquid radioactive iodine and, if needed, medications. In addition to medical treatment, a healthy diet, limited in certain foods, can help minimize your symptoms. Consuming a food you're allergic to can make hyperthyroidism symptoms worse. Symptoms may include skin rashes, difficulty breathing, abdominal cramps and diarrhea. If you suspect a food allergy, the University of Maryland Medical Center recommends avoiding potential culprits, which commonly include dairy products, wheat gluten, soy, corn and artificial food additives. When omitting dairy products, make sure you include other calcium sources, such as fortified rice or almond milk and seafood, in your diet. In place of wheat products, consume nutritious, gluten-free starches, such as gluten-free oatmeal, brown rice and sweet potatoes. Because elimination diets can be difficult, you may want to seek guidance and testing from your doctor or dietitian. Thyroid disorders can interfere with carbohydrate metabolism and blood sugar control — but you don't want to skimp on carbohydrates since they're your main energy source. To keep your blood sugar in a normal range and lower your risk for diabetes, which is linked strongly with thyroid disease, limit high-glycemic sources, which have a dramatic impact on blood sugar. Processed grains, such as white flour, sugary sweets, juices, low-fiber cereals, rice cakes and instant potatoes have a high-glycemic value. Choose fiber-rich carbohydrate sources, which have a lower glycemic impact, instead. Nutritious examples include barley, oatmeal, whole-grain pasta, yams and lentils. Goitrogens are natural substances that may interfere with thyroid hormone production. Because treatment for hyperthyroidism can lead to thyroid deficiencies — a condition called hypothyroidism — you may want to limit goitrogenic foods, particularly if you have an iodine deficiency. 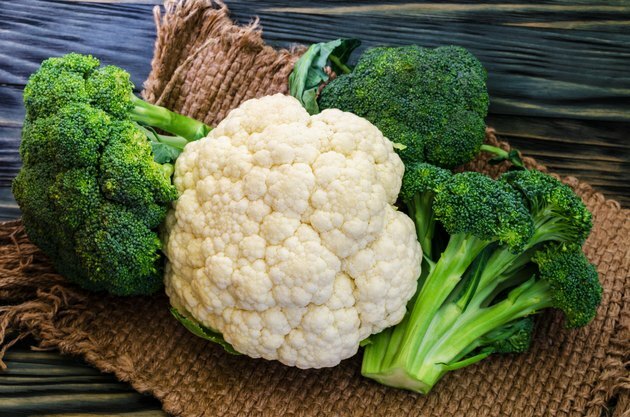 Cruciferous vegetables — such as cauliflower, broccoli and cabbage, soy and millet, a gluten-free grain — contain goitrogens. Although some research shows that soy doesn't interfere with thyroid hormones, Sheila Dean, a registered dietitian with the Palm Harbor Center for Health & Healing in Florida, suggests eating soy in moderation — up to one serving of soy milk or tofu per day, for example. Nongoitrogenic vegetable alternatives include carrots, asparagus, green beans, onions, garlic, lettuce and bell peppers. Instead of millet, have barley or wild rice. Trans fats and saturated fats increase inflammation, and cutting back your intake could help reduce overactive thyroid symptoms. Eat fewer red, fried and processed meats and high-fat dairy products, which contain saturated fat. Instead, rely on fish, skinless white-meat poultry and legumes for protein. Trans fats are prevalent in commercial baked goods, such as crackers, cookies, cakes, pastries and french fries — and any food that lists partially hydrogenated vegetable oil as an ingredient. Focus on whole foods, such as fruits, vegetables, nuts, seeds and whole grains over processed fare. Healthy omega-3 fats found in oily fish, such as salmon, as well as flaxseeds and walnuts, reduce inflammation and promote overall health. Alcohol and caffeine can interfere with mood balance, sleep, thyroid function and thyroid medications. Before consuming caffeinated products, such as soft drinks, coffee and black tea, talk to your doctor for guidance. Stay hydrated by drinking plenty of water or other non-caffeinated, nonalcoholic drinks, such as low-fat dairy or nondairy milk, sparkling water with lemon and herbal teas. Fresh fruits and vegetables and broth-based soups also promote hydration.